Harvest of Sharing SILENT AUCTION and Benefit Supper! Bidding and check-out instructions here. Featuring grilled pork loin and chicken quarters with baked potatoes, fruit salad, green beans, dinner roll, beverage and your choice of homemade pie! ​Carry-outs and local delivery are available! We typically have 700+ items for our silent auction! Check back in mid-September to browse an Auction Items Listing! Juicy grilled pork loin and chicken quarters highlight the menu of the Annual Benefit Supper. Our volunteer grillers turn out five-star quality meat, using their own special marinade. Baked potatoes, fruit salad, green beans, dinner roll, beverage and your choice of mouth-watering homemade pies round out the meal. We’ll be serving from 4-7 p.m. on Friday. 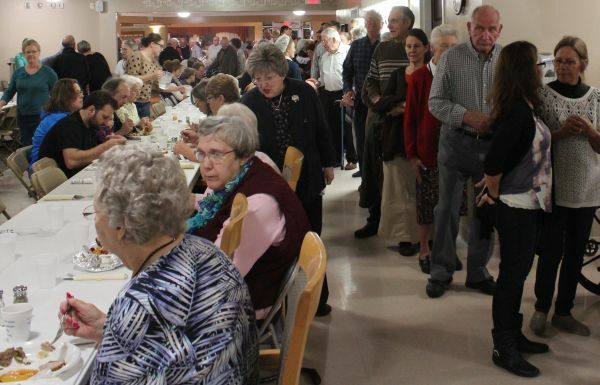 Dine-in meals are served in the main Fairview Haven dining room. Carry-out meals will be distributed at East Haven north garages next door to Fairview Haven. Donations are accepted at the door for meals. ​If you would like to make a donation to purchase coupons in advance on behalf of others, please contact Social Services or the Business Office. Auction Shopping Service - Take advantage of our Auction Shopping Service if you wish to support the Auction, but don’t know what to donate. Just send in a monetary donation at least three weeks prior to the auction. We will purchase an item for you and/or use the funds towards a larger package (i.e. overnight getaway). Tax Receipts Available - Donors will be asked to complete a valuation form for all donations. This will give us accurate values so that we can provide tax receipts to auction purchasers. We will be able to provide a separate tax receipt for bidders who are sharing an item. For example, if four bidders share the costs for a donated meal, we will provide each bidder a tax receipt for his portion of the cost. Fairview Haven is a non-profit organization. All donations are tax-deductible. AUCTION LOCATION - The Harvest of Sharing Silent Auction will be hosted at East Haven, just east of the main Fairview Haven building. Auction items will be displayed in the East Haven Commons room and in the south garages. Check-out will be in the Commons room after the auction. Watch for more details in the next issue of News From The Haven or online. Bidding Numbers - Bidding opens at 10 a.m. on Wednesday, Oct. 31, 2018. Bidding closes at 7:30 p.m. on Friday, Nov. 2, 2018. You must have a bidder's number to bid. Bidder's numbers will be available from Rick's office, the Social Services office or at East Haven. Bids may be increased in increments of $1.00 (minimum). Phone-A-Bid/Email-A-Bid - We are again offering Phone-A-Bid/Email-A-Bid service for supporters out of the area who wish to participate in bidding. You may register as a bidder and/or place a bid through our special email address (fairviewhaven1@gmail.com). If more convenient, you may also phone in a bid or register as a bidder at 815-692-2572. Ask for Sally, Anna, Rick or Dave. Phone-A-Bid and Email-A-Bid ends at 2 pm on Friday, Nov. 2. After that time, we will only have on-site bidding. Fairview Haven cannot be responsible for keeping track of bids for email or phone bids. We will be happy to raise bids for you if you email or phone a new bid, but, due to time constraints, we will not be able to be responsible for checking bids for you. Winning Bidder Notification - Email and Text Bid Notification: When registering for a bidder’s number, you will be asked for your email address and cell phone number. After the auction is closed and the winning bids are all entered into the computer, you will receive an email and/or a text message notifying you of any bids you may have won (or if you didn’t win any). Winning bidders who don’t have email or texting or who prefer not to use this service will still be notified on Monday with a phone call. Check-Out - The cashiers' stations will be located in the East Haven Commons Room. Please form a single-file line down the north hallway of East Haven. Look for signs and ushers to direct you. Please present your bidder's number at time of purchase. Late Check-Out Service will be offered until 9 pm if you wish to go home on Friday and return later when the crowd has dissipated to pick up your items. We are not able to offer weekend check-out. If you have not been notified by email of your winning bids, you will be notified by phone on Monday. If you wish to call in and check if you were the winning bidder on any items, please feel to call 815-692-2572 and ask for Social Services. Please wait to call until after 10 a.m. on Monday. Payment - Cash, checks, or credit cards (Discover, Visa or Mastercard) may be used for purchases from the auction or for donations. The proceeds of the 2018 Harvest of Sharing Benefit will be used towards the Good Samaritan Fund of Fairview Haven. Harvest of Sharing is the largest single source of income for the Good Samaritan Fund. Thanks and may God bless each cheerful giver!